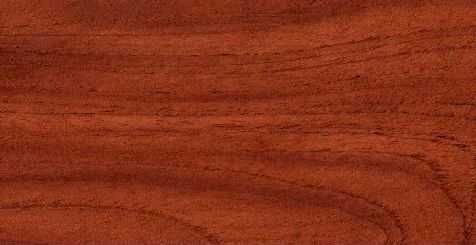 Mahogany (Swietenia macrophylla) is known as a premium furniture wood. Unfortunately, it is rapidly disappearing from the planet. The Convention on International Trade in Endangered Species (CITES) has listed mahogany (called caoba in Costa Rica) as endangered. We surmise that this is part of the reason for the 25% price increase in mahogany over the past year. The problem has been illegal harvesting of the wood from rain forests, with very little being planted. The photo shows a mahogany tree on our plantation at four months old, next to a 1-meter flat. Mahogany can be challenging to grow in a plantation. The shoot-borer (Hypsipylla grandella) that attacks the leading shoot leaves a tree with a low fork or multiple leaders and little or no timber value. This same pest attacks Spanish cedar as well. We would prefer not to lose mahogany as a wood for making furniture, and we definitely don't like the idea of removing it from rain forest. Mahogany is a gorgeous wood with wonderful woodworking characteristics, and it would be a shame to have to abandon it. The following present solutions are possible. Plant it spread out. This has been found to work well in Costa Rica, as reported at a seminar our forester attended. Planting mahogany at no more than 15% among other species has yielded good results. Prune extensively. If you continue to prune for the first three years, eventually the threat of the shoot-borer is removed. The shoot-borer only attacks young trees. This approach is fairly labor-intensive as well as causing the loss of a percentage of the trunk. This method is used in some plantations. Mahogany growth depends considerably on the soil and climate the trees are planted in. The production of mahogany is between 5 and 30 cubic meters per year. This means that it can produce more than teak (at 12 to 26 cubic meters), but in the wrong environment, considerably less. The growth rate is consistent for the first 30 years, like most tropical hardwoods. This is very good, since if you measure your trees for the first couple of years, you should be able to project your eventual yields. The 2005 valuation of mahogany is about triple that of teak, while in 2002 it was half that of teak. It is likely to continue to increase dramatically, as the demand for mahogany is definitely not dropping, and the supply is clearly shrinking.